The Cessna 310 was the first twin-engine aircraft design from Cessna to enter production after World War II. Typical of Cessna model naming conventions, a letter was added after the model number to identify changes to the original design over the years. The first significant upgrade to the 310 series was the 310C in 1959, which introduced more powerful 260 hp (195 kW) Continental IO-470-D engines. In 1960 the 310D featured swept back vertical tail surfaces. An extra cabin window was added with the 310F. The 320 Skyknight was developed from the 310F, which featured turbocharged TSIO-470-B engines and a fourth cabin side-window. The Skyknight was in production between 1961 and 1969 (the 320E was named the Executive Skyknight), when it was replaced by the similar Turbo 310. The 310G introduced the 'stabilatip' tip tanks, while the 310K replaced the rear two windows with a single unit. Subsequent developments include the 310Q and turbocharged T310Q with redesigned rear cabin with a skylight window, and the final 310R and T310R, identifiable for their lengthened noses. Production ended in 1980. Over the years there were several modifications to the 310 to improve performance. Noted aircraft engineer Jack Riley produced 2 variants. The Riley Rocket 310 and the Riley Turbostream 310. Only seven of the latter modifications took place and the Riley Turbostream is perhaps the highest performance civilian piston light twin in existence. Riley replaced the standard Continental 310 hp (230 kW) engines with Lycoming TIO540 350 HP engines. These turbo-charged intercooled engines were installed with 3 blade Hartzell propellers in a counter-rotating configuration to further increase performance and single engine safety. At 5,400 lb (2,400 kg). gross weight the aircraft had a weight to power ratio of 7.71 lb (3.50 kg). per horsepower. This resulted in a cruising speed of 260 knots (480 km/h) at 18,000 feet (5,500 m) and a rate of climb 3,000FPM. Cessna T310P equipped with a nose-mounted IR detection system for forest fire detection. The Cessna 310 was a common charter aircraft for the many air taxi firms that sprang up in the general aviation boom that followed World War II. 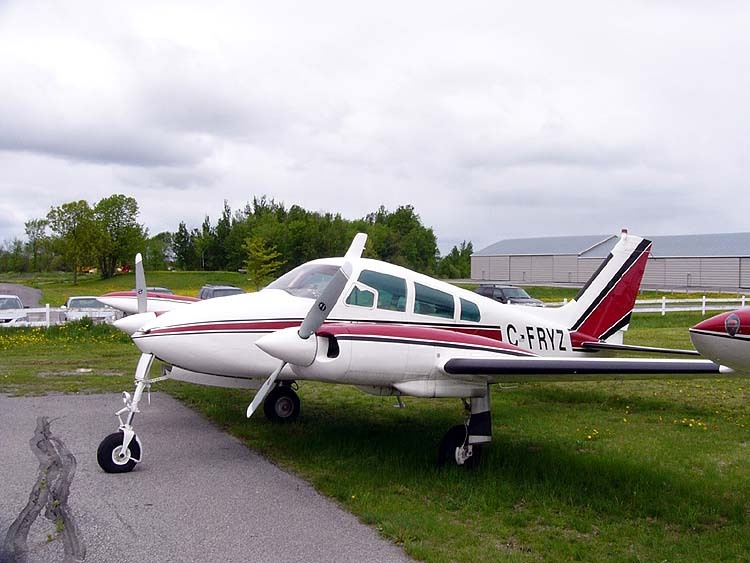 The advantages to the Cessna 310 over its contemporaries, such as the Piper Aztec, were its speed, operating costs and after market modifications such as the Robertson STOL kits which made it popular world wide for its bush flying characteristics. It could access short fields while at the same time carrying a large useful load of 2,000 lb (910 kg). or more at high speeds for a twin engine piston aircraft. 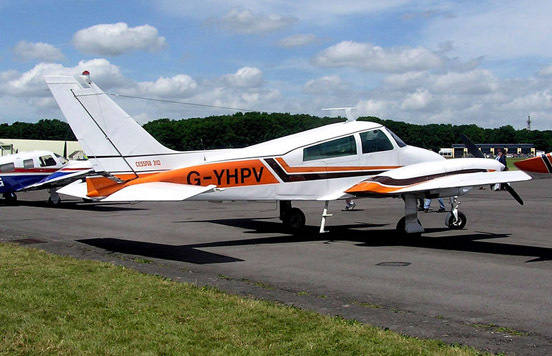 Other competitive planes to the Cessna 310 include the Raytheon (Beech) Baron, the Piper Seneca and arguably, some models of the Aero Commander. As of 2006, many Cessna 310s are in operation in air taxi service world wide. In 1957, the US Air Force selected the Cessna 310 for service as a light utility aircraft for transport and administrative support. The USAF purchased 160 unmodified 310A aircraft with the designation L-27A and named Blue Canoe, later changed to U-3A in 1962. An additional 35 upgraded 310Ms designated L-27B(later U-3B) were delivered in 1960-61; these aircraft were equipped with the more powerful engines used in the 310C, and can be identified by their extra cabin windows, longer nose and swept vertical fin. Production aircraft powered by two 240 hp (180 kW) Continental O-470-B engines, 547 built. Military version of the 310 for the United States Air Force, designated L-27A and later U-3A, 160 built. 310 with new instrument panel, O-470-M engines and minor changes, 225 built. 310B with 260 hp (190 kW) IO-470-D engines, increased take-off weight and minor changes, 259 built. 310C with swept vertical tail and minor detail changes, 268 built. Military version of the 310F, designated the L-27B and later U-3B, 36 built. 310D with extra cabin window each side, pointed nose, new tip tank shape and other minor changes, 156 built. 310F with slimline tip tanks, six-seat cabin an increased take-off weight and detail changes, 156 built. 310G with increased take-off weight and enlarged cabin interior, 148 built. 310H with IO-470-U engines, baggage compartments in rear of engine nacelles and minor detail changes, 200 built. 310I with minor detailed changes, 200 built. 310J with long 'vista view' side windows, increased take-off weight and IO-470-V engines, 245 built. 310K with single-piece windshield, re-designed undercarriage, increased fuel capacity and minor changes, 207 built. 310L with revised instrument panel, optional fuel tanks in engine nacelles, IO-470-V-O engines and minor changes, 198 built. 310N with a shorter nose undercarriage leg, ventral fin, and optional turbocharged Continental TSIO-520-B engines, 240 built. 310P with take-off weight increased to 5,300 lb (2,400 kg) and detailed changes, from the 401st aircraft fitted with a bulged rear cabin roof with rear view window, 1160 built. 310Q with three-bladed propellers, lengthened nose with baggage compartment, 5,500 lb (2,500 kg) take-off weight and 285 hp (213 kW) IO-520-M engines, 1332 built. Enlarged version of the 310F with six seats, larger cabin and two turbocharged engines, 110 built. 320 with stabil-tip fuel tanks and minor changes, 47 built. 320A with nacelle baggage lockers and minor changes, 62 built. 320B with a longer cabin, optional seventh seat and minor changes, 73 built. 320C with reshaped rear windows and 285 hp (213 kW) TSIO-520-B engines, 130 built. 320D with pointed nose, single piece windshield, modified undercarriage, increased take-off weight and minor changes, 110 built. 320E with minor changes, 45 built. Countries known to have operated the U-3/310 include Colombia, Ecuador, El Salvador, France, Indonesia, Iran, Madagascar, Mexico, Paraguay (Paraguayan Naval Aviation & Paraguayan Army Aviation), Peru, Philippines, South Africa, Tanzania, Trinidad and Tobago, United States (United States Air Force United States Navy & US Army), Venezuela, Uruguay and Zaire. 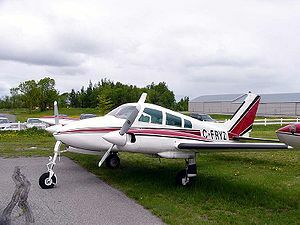 On Tuesday July 10, 2007, a Cessna 310, originating from Daytona Beach International Airport, Florida en route to Lakeland Linder Regional Airport crashed into two homes in Sanford, Florida, near Orlando, killing five people -- the pilot, his passenger, and three people inside the houses. The pilot reported smoke in the cockpit and attempted an emergency landing at nearby Orlando Sanford International Airport. NASCAR said the pilot of the plane was Michael Klemm, a senior captain with NASCAR Aviation. His passenger was Dr. Bruce Kennedy, husband of International Speedway Corporation president Lesa France Kennedy, the daughter of the longtime head of NASCAR, Bill France, Jr., who died in June. They were the only two people on the plane, according to both NASCAR and the NTSB. Four people also were injured, three of whom were critically burned, authorities said. The NTSB factual report dated December 2007 indicates that the accident was caused by an electrical malfunction, including smoke in the cockpit, that occurred on the previous flight and that was not rectified prior to the accident flight, resulting in the subsequent fire. The accident pilot was informed about the known problem prior to flight, but elected to fly the aircraft regardless. The Cessna 310-B Songbird, registration N5348A, gained fame from being featured in the popular TV show Sky King during the late 1950s.